I have been knitting for many years now – my grandma taught me when I was young. I had one spool of yarn and a square that she helped me start. I worked on from time to time making it longer. I remember the yarn being a light olive green. I picked knitting up again within the last 10 years. I have made many scarfs, a felted purse, and a knitted square bunny. At this point I haven’t gotten into cables, or more advanced knitting patterns – but I’m sure I could figure it out or take a lesson if I really wanted to get into it. But I always thought crocheting was interesting, it seemed like it was versatile and could be used to create some more interesting patterns and possibly even small stuffed animals. 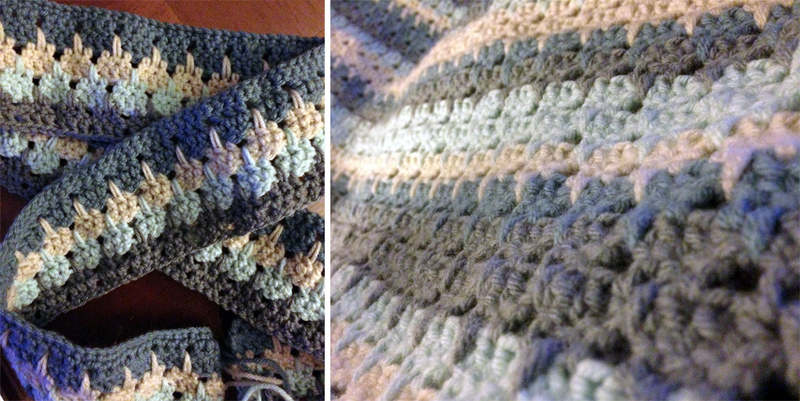 Towards the end of 2013 I started teaching myself how to crochet. I started with simple headbands and did some practice granny squares and hexagons. But I’ve always wanted to work on a blanket. So I turned to Pinterest and found a pattern I found interesting but simple enough so I could follow it fairly easily. 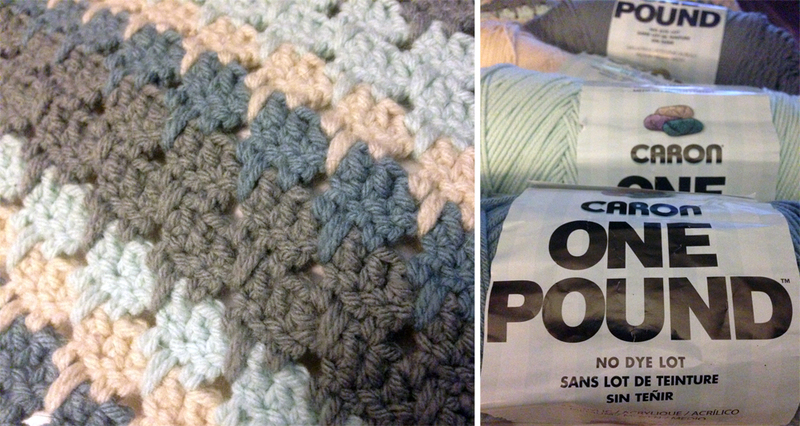 Next I had to find yarn to use – once again never have made a blanket before I had no idea how much yarn it would take. So I opted to purchase Caron’s One Pound 100% acrylic yarn partially because it has “No Dye Lot” so hopefully if I happen to need more – the yarn will match without it being noticeable. I choose these 4 colors to alternate: Grey, Off White, Pale Green, and Azure. I picked a pattern rotates between the 4 colors but rotates an expanded color stripe. I started working on this back in early March and I don’t have a specific deadline in mind. Basically if I’m just planning on watching TV or a movie – I have been picking it up to work on it too. I’m happy with my progress so far. I will follow up on this project as I get further along/finish. So far crochet is comparable to knitting – but since I’m most working in a double crochet – it seems to be growing faster than a project would if I was knitting.